Medford Council Candidates Keturah Harris and Patrick Progar on Main Street. Photo provided by MedfordNJDemocrats. 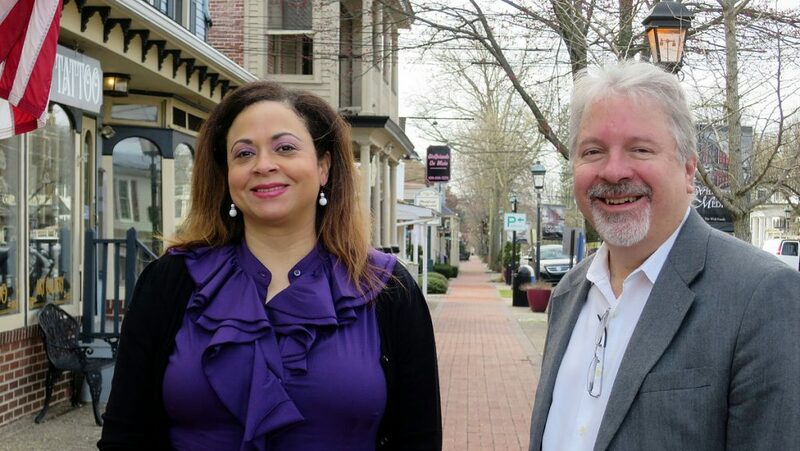 On Monday March 25, the Medford Democratic Committee endorsed Keturah “Key” Harris and Patrick Progar in their run for Medford Township Council in the Democratic primary on Tuesday, June 4. “When I look at these two candidates, I see intelligence, leadership, and compassion. They use their careers to make life better for those around them and they want to use their experience to extend that to the people of Medford,” said Kelly Clark, Medford Democratic Committee Chairwoman. Keturah “Key” Harris is a 25-year resident of Medford, a mother, and for the past 15 years, a special education teacher at the Burlington County Institute of Technology. Keturah earned her BA in Psychology from Rutgers University-Camden and her Masters in Educational Leadership from Delaware Valley University. Keturah is now pursuing her doctorate in Transformational Leadership at Concordia University while continuing to teach and raise her daughter. Keturah went into teaching because she strongly believes in supporting and advocating for people with special needs. In her spare time, Keturah enjoys spending time with her daughter and family. She is actively involved in different organizations such as the American Association of University Women (AAUW), whose mission is to advance “equity for women and girls through advocacy, education, and research,” and as a volunteer at the Alice Paul Institute in Mount Laurel, an institute named after one of Burlington County’s leading historical figures, suffragette, and political activist, where Keturah helps to promote equality, equity, and education for all girls and women. Patrick Progar, Ph.D., BCBA-D is Executive Director of Princeton Child Development Institute (PCDI), a school for children and adults with autism. Patrick has worked at PCDI since July 2014, when he was hired as Director of the Adult Life Skills Program. Patrick was promoted to Executive Director of PCDI in May 2016, where he oversees the education, adult and community living programs. In their mission for providing effective, science-based intervention for children and adults with autism at PCDI, Patrick oversees approximately 75 staff, and manages a budget of approximately 7 million dollars. Funding for the programs comes from a variety of sources, including sending school districts, the state of New Jersey, and Medicaid. To supplement those sources of revenue, Patrick has been instrumental in increasing fundraising at PCDI by approximately 100% over the last two years including a very successful 5K / 10K trail run through Rosedale Park in Princeton, and a spring gala held at the Grounds for Sculpture the past two years. Prior to this, Patrick was the Vice President for Academic Affairs (VPAA) and Professor of Applied Behavior Analysis at Caldwell College (now Caldwell University). In his role as a tenured faculty member, department chair and later VPAA, Patrick was instrumental in starting a very successful BSN program, developed the first doctoral program in New Jersey in the area of applied behavior analysis (ABA), and developed an onsite autism center. The ABA doctoral program and autism center were especially critical for the state of New Jersey as we lead the nation in the incidence of autism. The doctoral program was designed to train outstanding clinicians who would then use their newfound skills when working for school districts and other providers in the state. As VPAA, Patrick managed an annual budget of over 15 million dollars and reported directly to the president of the college. Patrick was born and raised in Sheboygan, Wisconsin and later received his BA degree from the University of Wisconsin – Eau Claire and his MS and Ph.D. degrees from the University of Wisconsin-Milwaukee. Patrick is married to Felicia Progar, and has four grown children, two pugs and a ginger cat. In his spare time, Patrick likes to jog and go for walks, reading, and work outside. Patrick has served as President of a local soccer club for five years and was a founding member of the New Jersey Association for Behavior Analysis where he served as Treasurer for several years. Patrick and his family have resided in the Cardinal Ridge neighborhood in Medford since 2001. The Medford Democratic Committee is proud to endorse these two community leaders in their candidacy for Medford Township Council. For more information on these candidates, check out their social media at the following links.